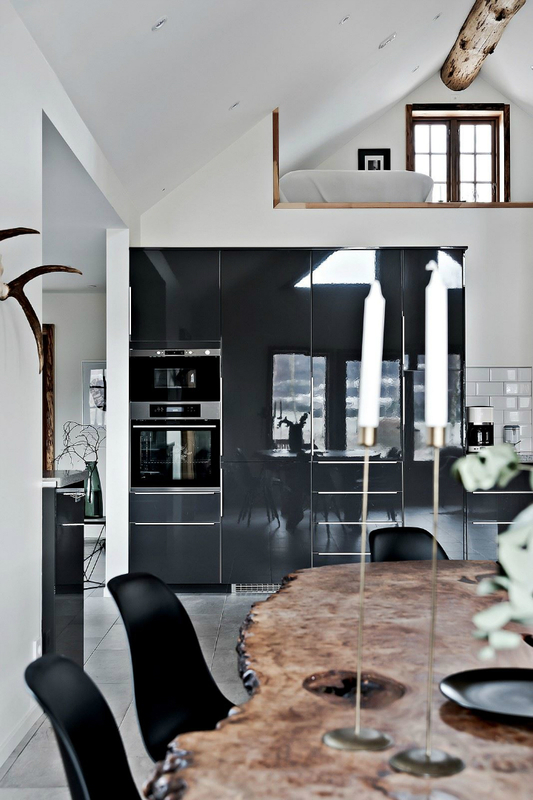 Hunting lodge meets modern European interior design– what’s not to love? 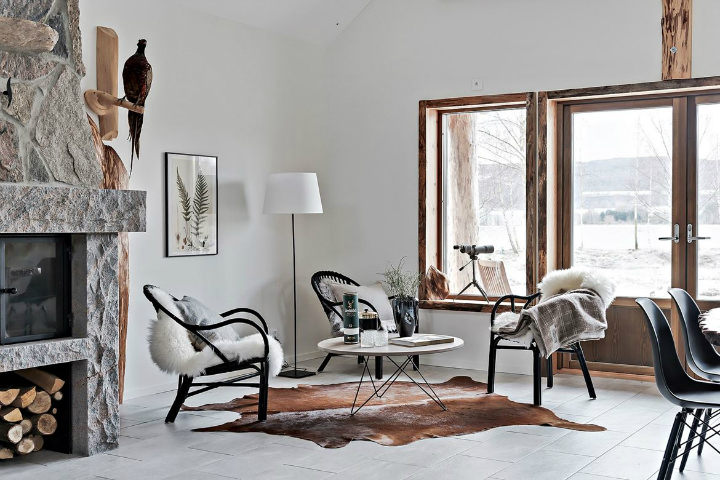 From high ceilings to the clean white backdrop, this Bastad hunting lodge is truly one of a kind. 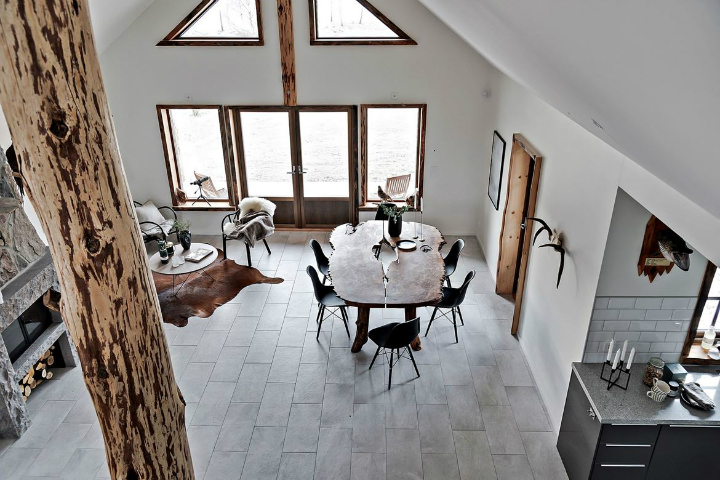 This open-plan home is spacious and is homey with that traditional rugged feel seen in the living room, which is filled with fluffy white chairs and soft grays juxtaposed against woods, white, black chairs, and a gorgeous stone fireplace. 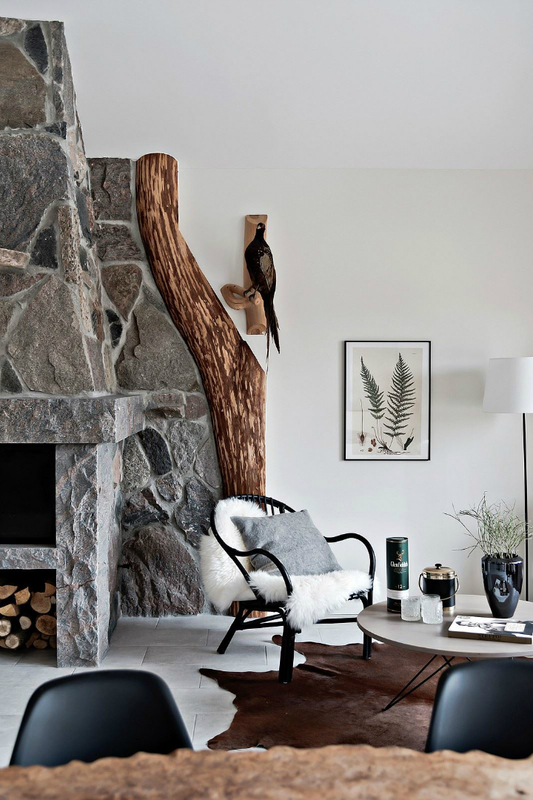 A stuffed bird, animal hide rug on the floor, and fern print on the wall round out what is clearly a naturalistic theme! 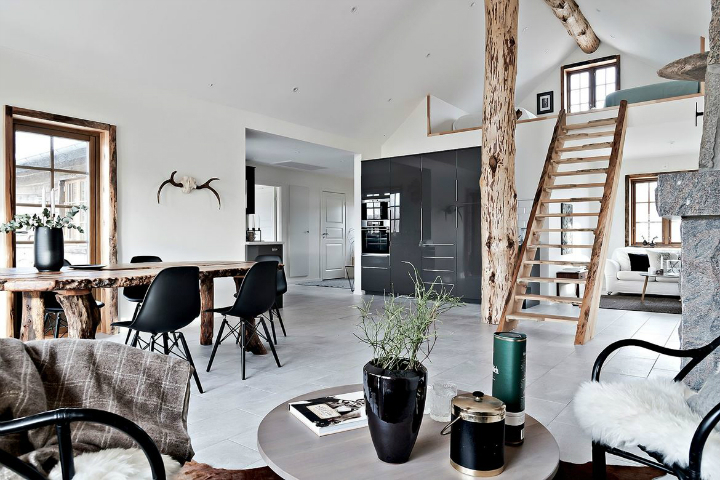 Take the sitting area as design inspiration. 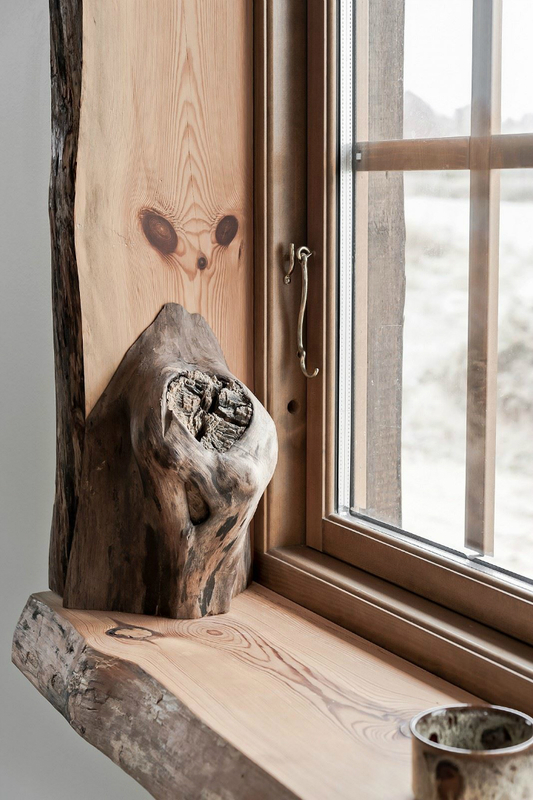 This little nook features warm wooden windows and a table, with textile furnishings in white, black, and gray. 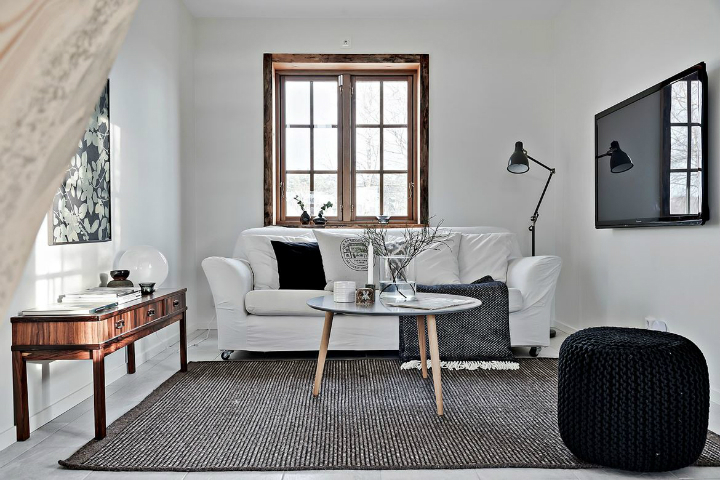 The white sofa and rounded coffee table make the room a bit more homey, while a mirror and piece of art balance the room and provide symmetry. On to the kitchen, which is a total contrast from the sitting room. 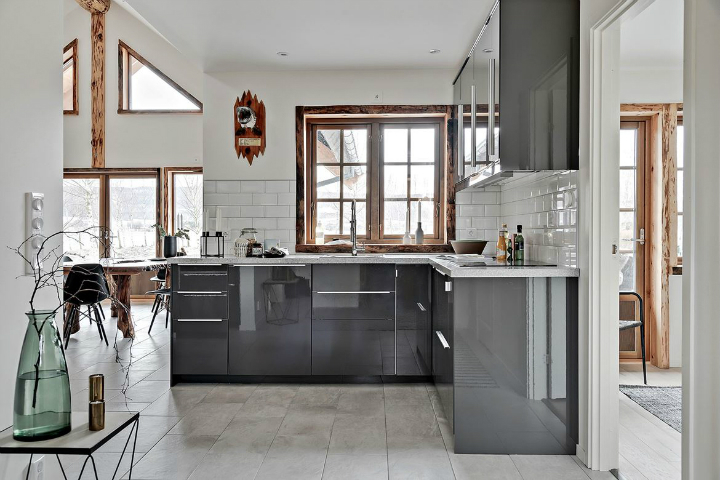 Part of the open floor plan, a sleek black refrigerator adds style while black chairs keep the theme going. 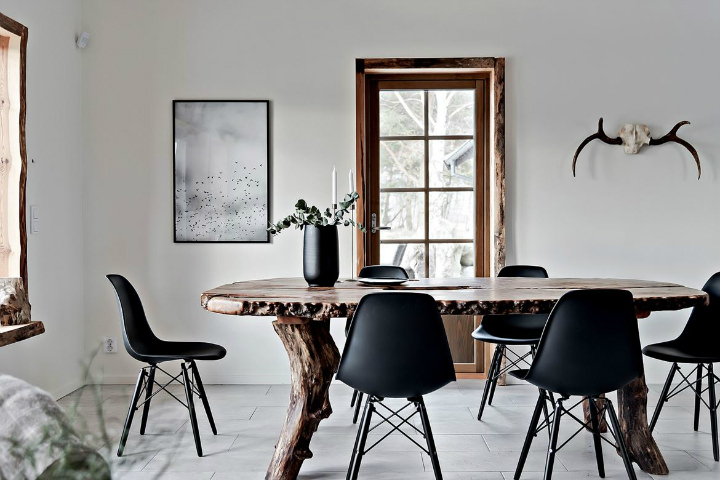 It’s all centered around a stunning wooden table. 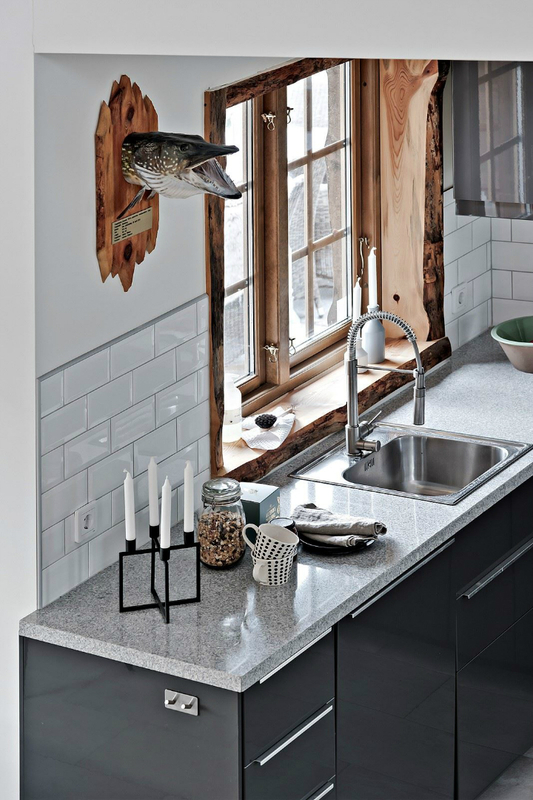 A skull on the wall adds some hunter flair. 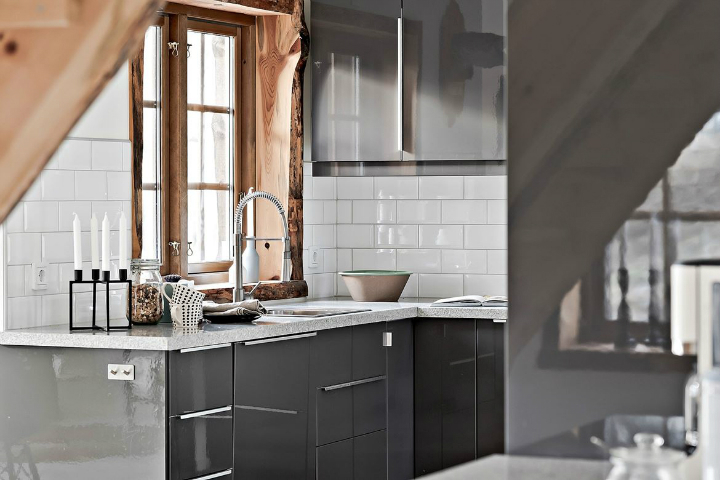 Meanwhile, the counter area has glossy gray cabinets and gray and white marble tile that makes this theme modern, not dated. Add a few candles and a fish head on the wall, and you’re all set. 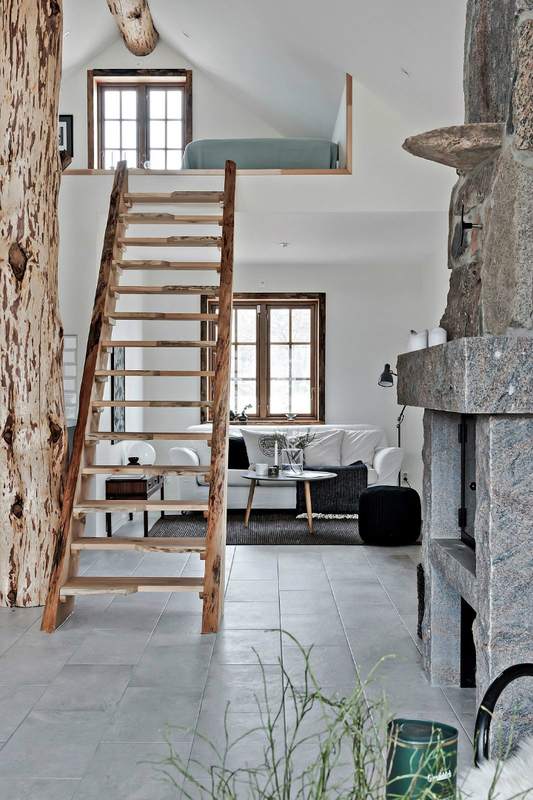 Now go upstairs to the loft via wooden ladder stairs. The sleeping loft is less busy than the rest of the house. 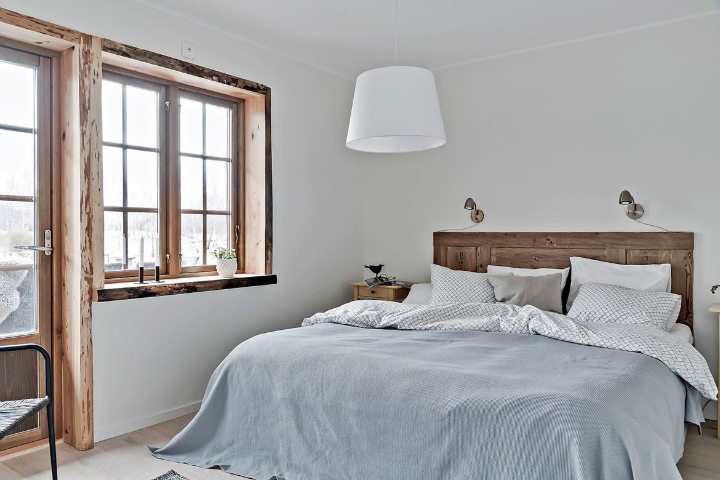 Simple white walls and beds with light linens provide a calming atmosphere, while the wooden floor and windows provide a bit of rustic contrast. A nice lamp and a framed photo complete this peaceful space. Serene but with a touch of pale blue, the master bedroom is the place to be. 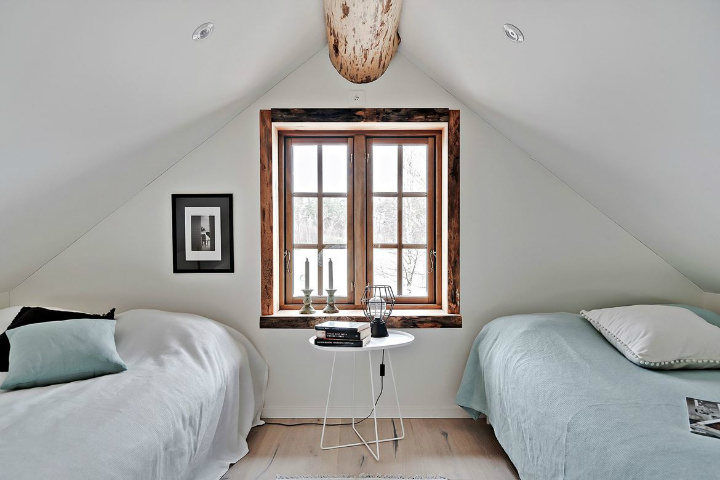 Warm open wooden windows, white walls, a wooden headboard/side tables with a hanging white lamp promote harmony and relaxation. 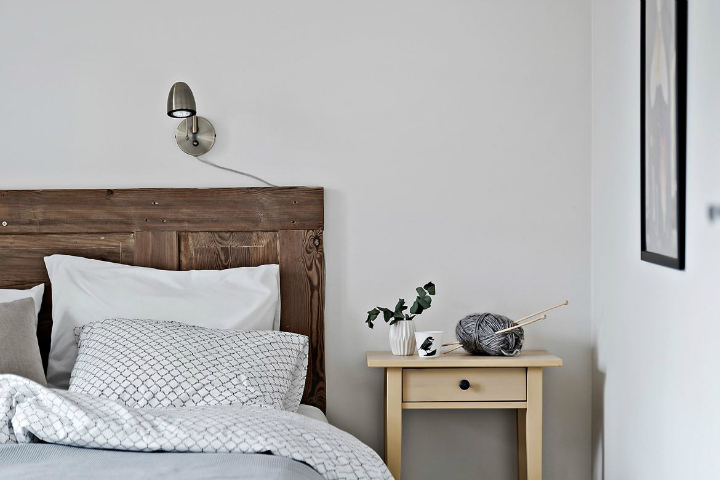 An overhead lamp and framed photo add a little more to the room, while a light blue comforter and understated patterned linens make this the perfect spot to fall asleep or have coffee and read the newspaper in the morning. 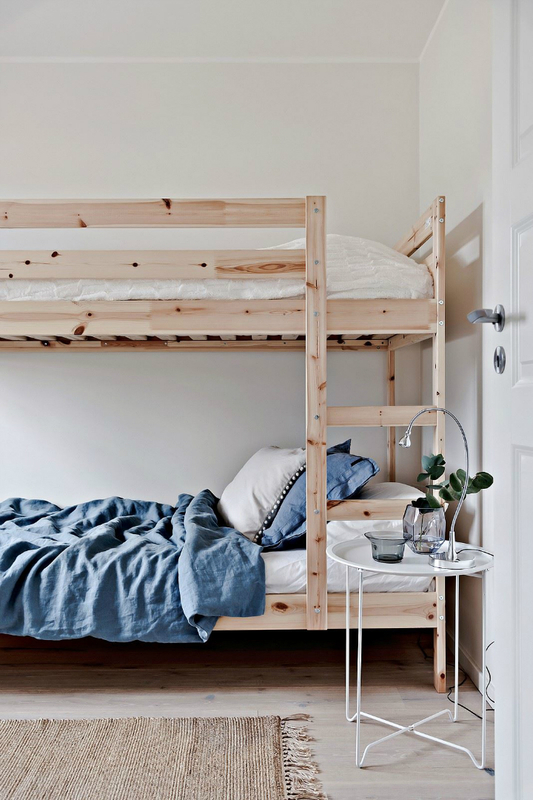 Wooden bunk beds in the other bedroom are great for guests, especially kids. 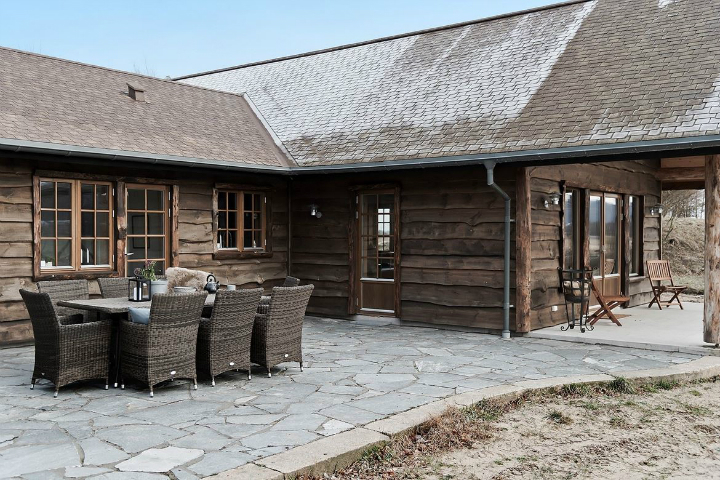 A paved patio outside with wicker chairs and table completes this hunting lodge-inspired house. 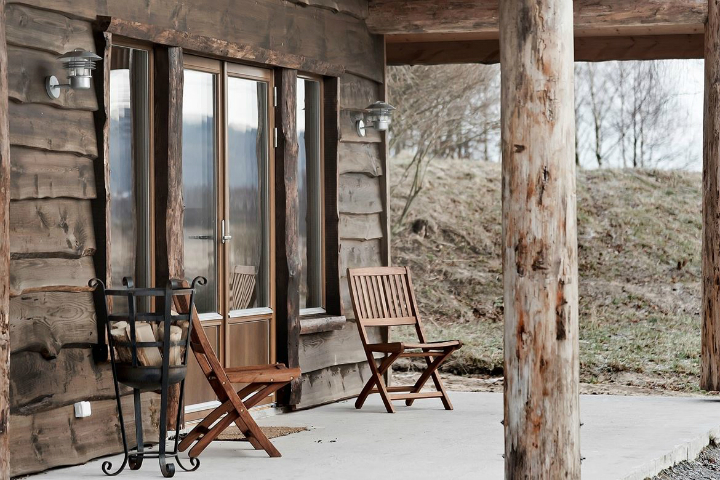 But wait, before you go: one last clean room with rustic touches. The hallway is pure white with a wooden door frame. 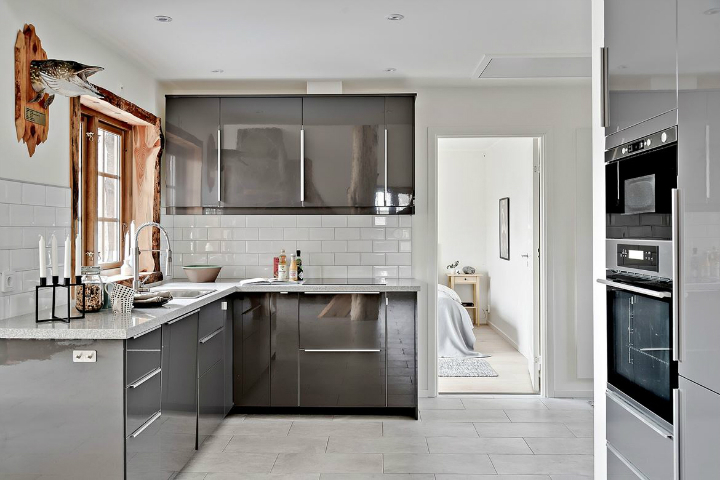 With gray tile and an understated hall table, it’s the perfect introduction to this home and what to expect going onward. What are your favorite aspects of this home? 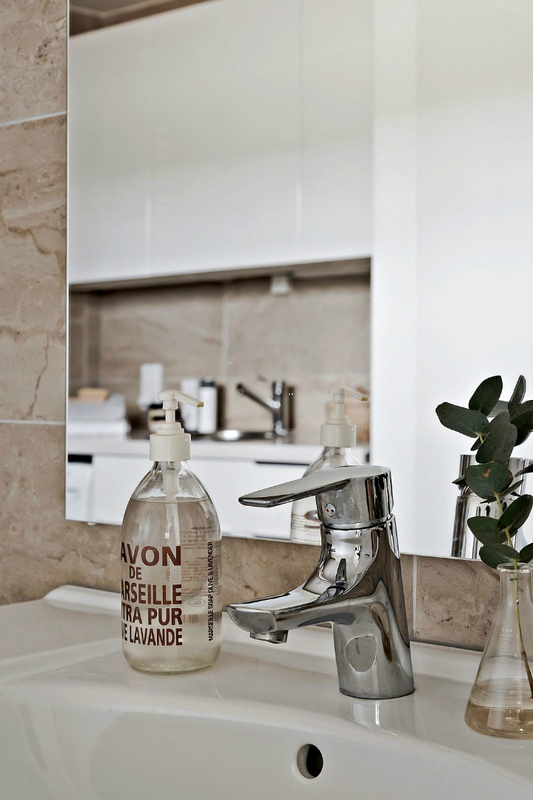 What do you love more– the clean design or the rustic touches? Tell us in the comments!